I bought these 1950s barkcloth curtains, and I was going to resell them at the shop. But then I brought them home from the shop and pinned them up at the windows. The color of the flowers is the same as my living room curtains, and they look pretty nice. So I'm seeing if I can remake them for the little bay window in the dining room. I'm lucky they were long enough to be apron length curtains. Right now I'm trying to decide whether to hang them with the rings showing more (as they are in this picture), or with the hooks through the rings, which makes them hang a bit higher and hides the rods. That might be good because, as you can see, the rods are not custom bent for this bay..they are just 3 rods hung at the same height. I really like the looks of the rings showing though, so I'm thinking I will go that way. I'll deal with the rods somehow. 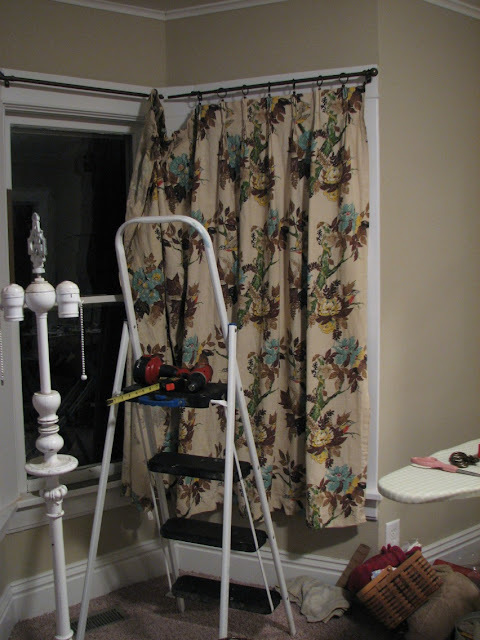 These curtains were such a good bargain that I might even look for others, so I can change out the look at the holidays or during the summer...mabye something lighter for summer.